European societies are facing an unprecedented set of challenges—from aging populations, rapidly changing labor markets, and political polarization, to immigration and a diversification of communities large and small. These intersecting dynamics and social pressures have been felt particularly keenly in areas experiencing a sluggish recovery from the economic crisis that began in 2007 and those that have only recently begun to adapt public services to serve increasingly diverse populations. In this shifting landscape, the common view of immigrant integration as a linear process through which migrants and host societies adjust to one another may seem somewhat simplistic. As the authors of this report note, “Newcomers are heterogeneous in their characteristics and needs, and host societies are hardly harmonious monoliths.” Instead of thinking about integration as a fixed end point that can be accomplished, they argue, it may be more helpful to treat it as a skill for all members of a society to strengthen on an ongoing basis—the capacity to live amidst diversity and weather change. Working toward this more ambitious, whole-of-society view of integration, policymakers will need a new set of tools and approaches. 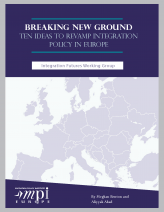 This report highlights the most promising ideas explored as part of the Migration Policy Institute Europe’s multiyear Integration Futures Working Group. Among them are suggestions for helping all workers navigate changing labor markets, adapting public services and education systems to diversity of all kinds, and building partnerships with new stakeholders—from tech start-ups to volunteer organizations.